A portable garage (also known as a garage in a box or a portable carport) is a good choice for someone who wants a garage but they don’t necessarily have the time or funds to build or buy a traditional garage (Source). 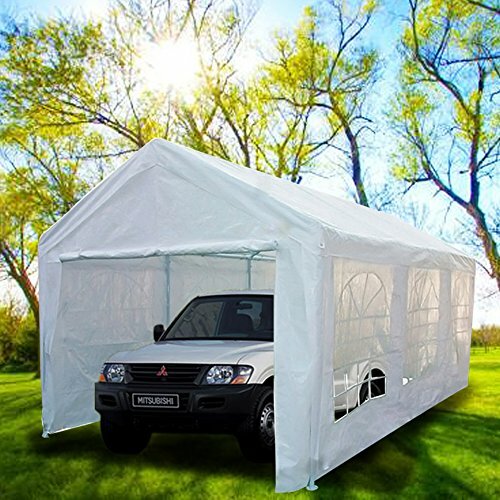 These car tents are an easy way to erect a temporary garage and protect your hobby, show, or regular car from inclement weather (Source). The way that a portable or instant garage works is that it is assembled much like a tent and then used to store your car. It’s rather simple but many people have concerns when it comes to the auto safety that this offers to owners (Source). 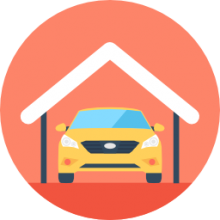 If you are concerned about this, these pop-up garages can have an alarm system set up to alert you if anything suspicious or concerning happens. 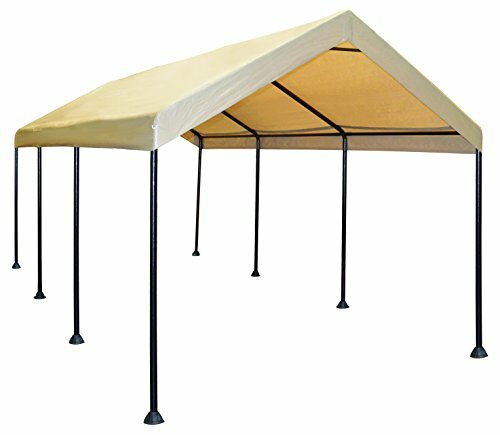 The King Canopy is a universal option with 6 legs and nearly 9 feet of interior clearance. The first bit of advice that customers offer is to not try to assemble it yourself. Not only can some of the pop-up garage parts be heavy or awkward to maneuver, they also tend to take more than two hands to get everything the way you need. Many also suggested that if your portable carport doesn’t have an anchoring system that you buy one separately so it doesn’t collapse onto your car instead of housing it. The first consideration for these portable garages is size. For the Peaktop, Caravan Canopy, and ShelterLogic Model 62680, this measurement reaches 10 by 20 feet. The ShelterLogic Garage in a Box is slightly larger at 12 by 20 feet. Unfortunately, the ShelterLogic Shed in a Box doesn’t disclose its exact measurements for comparison. The next thing you should consider is what sort of weather can you expect these portable garages to hold up to. Unfortunately, on a durability front, most of these portable garages couldn’t stand up to anything more than rain. When it came to snow and storms, they caved rather easily. However, not every portable garage failed the durability test. Many customers of the ShelterLogic Shed in a Box were impressed by how well it held up. One customer even noted that in 28 inches of snow, her instant garage didn’t collapse. Instead, this shed in a box has a design that allows snow to slide off. This allows the portable garage to not bear the weight of the snow, keeping it upright and standing up nicely to its competition. How Do You Use a Portable Garage? Next, you will need to brace the poles somehow. Once again, this exact method will depend a little bit on which prefab garage you choose. Finally, you will need to install the tarp over the poles. This portable carport offered by Peaktop is affordable, heavy-duty, well-made, and easy to set up. Users love the heavy-duty, rust-resistant steel framework with a metal base, but some do note that it’s not suitable for windy days. 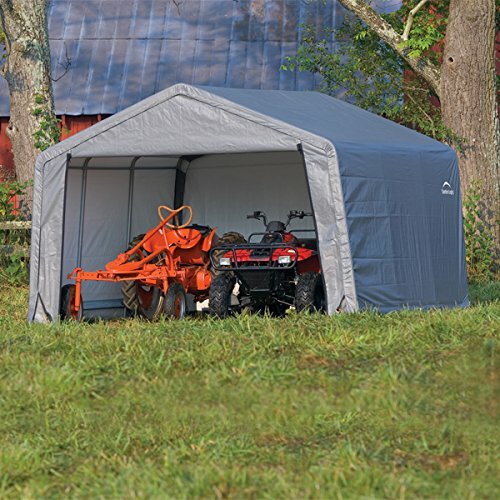 The Peaktop portable garage measures 20’ x 10’ x 9’, and it features a waterproofed polyethylene cover, two removable sidewalls, and a transparent pane window. Another great thing about this product is that it has 38mm-thick steel poles for stability and double zipper doors on both ends. However, the manufacturer advises that you don’t use this carport during heavy snow. As a whole, buyers have a favorable opinion regarding Peaktop portable carport, and they praise its stability and usefulness. A reviewer comments that the portable car shelter is holding up better than he expected and that it’s rugged and durable. He highly recommends it to anyone looking for an affordable portable carport. Another user mentions that it’s not difficult to set up the car shelter because the instructions are clear and easy to follow. He adds that he has been using it for a couple of months with no issues and that he is very pleased with his purchase. However, some customers have said that the car canopy is not waterproofed and that a strong wind will break the poles. If you want to keep your car out of the harsh weather, you might take a look at this gray shed-in-a-box offered by Shelter Logic. Users love the quality of the shed, but some do note that it’s a nightmare to assemble it. The Shelter Logic portable carport is available in several sizes from 6’ x 6’ to 12’ x 12’, and it features a high-grade steel frame, a premium powder coat finish, which is rust and corrosion-resistant, and a triple-layer polyethylene cover, heat-sealed for maximum water resistance. Another great thing about this portable garage is that it has a quality ratchet to keep the cover tight and an easy slide cross rail system. A reviewer comments that the quality of the Shelter Logic shed-in-a-box is exceptional and everything is precisely cut and shaped. However, he warns that you need at least two people to assemble it and that the instructions are not well-written. Another user mentions that the anchor system is one of the best he has ever seen and that it holds up well even in windy weather. A buyer also notes that the shed survived a New England winter with no issues and that he highly recommends it as the best portable garage. However, some customers have said that parts were missing and that the glue that holds the tubes starts to melt on a hot day. This white portable carport offered by Caravan Canopy is affordable, easy to assemble and it’s also suitable for organizing parties and catering. Users love the price, but some do note that the package arrived damaged. The Caravan Canopy car garage measures 10’ x 20’, and it features a water-resistant, heat-sealed top, a steel frame with a compression lock and a rust-resistant powdered finish, and 1-3/8-inch tubes for stability. Another great thing about this product is that the top is UV treated for durability. Moreover, the portable garage shed has a 1-year limited warranty. In general, users have a favorable opinion regarding the Caravan Canopy carport, but they agree that the tubes are too light. A reviewer comments that it took him 30 minutes to assemble the car canopy and that he did it all by himself. He adds that it’s holding up pretty well on windy days. Another buyer mentions that his 19.5’-long boat fits perfectly inside and that he is very pleased with its stability. A user also notes that if you properly stake the portable car garage, it will survive winds up to 30 mph. He highly recommends it to anyone looking for a cheap portable garage. However, some customers have said that the carport is cheaply made and that it’s not worth its price. Some also say that even a small amount of wind will deform the poles. If you need a reliable portable carport, you might take a look at this instant garage shelter offered by Shelter Logic. Users love the easy slide cross rail system to lock down the cover, but some do note that parts were missing and the package was damaged. 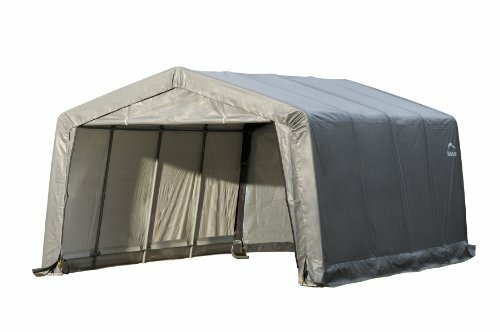 The Shelter Logic portable garage measures 10’x 20’, and it features a 1-3/8” steel frame, a rust-resistant, thermoset finish, and a triple-layer, waterproofed cover, which is UV-treated to withstand the elements. Another great thing about this product is that it has patented Shelter Logic stabilizers for extra stability and durability. A buyer comments that it takes time to assemble the sandstone carport because there are a lot of parts to be sorted. Nevertheless, he says that the structure seems sturdy and that it should survive a couple of seasons with no issues. Another reviewer mentions that he has been using it for six months and that he is very pleased with the quality and stability of the Shelter Logic sandstone car garage. A user also notes that you need at least two people to set up the carport and that he doesn’t have issues with the zippers even during the winter. However, some customers have said that the carport is not suitable for windy days and that the cover tears easily. This garage-in-a-box offered by Shelter Logic is practical, durable, and it’s available in two models – 12’ x 16 and 12’ x 20’. Users love the ratchet tile tensioning, but some do note that the cover isn’t very heavy. The Shelter Logic portable garage features a 1-3/8” steel frame, a thermoset powdered coat finish, a patent Shelter Lock stabilizers for stability, and an easy slide cross rail system. Another great thing about this product is that it has a triple layer, waterproofed cover, which is UV-treated inside and out. Moreover, the carport also has bolt together hardware at every roof joint. A reviewer observes that the assembly instructions are well-written and easy to follow. He adds that it took him 8 hours to build it by himself and that the portable carport is sturdier than he expected. A user also shares that the ratchet keeps the cover taut and that he highly recommends it as the best portable garage available. Another purchaser states that he has been using the carport for two years and that he is very impressed with the steel construction. However, some customers have said that the cover won’t last more than a year and that there is a zipped door only on one side. Some also note that the car shelter collapses under heavy snow. What Are Car Owners Saying? Examining buyer experience using portable garages, we checked out jalopyjournal.com and read through some of the forum message boards dedicated to this topic. One individual had a project car they want to store in the winter- a car storage project. They were considering purchasing a portable canvas shelter that has a zippered front but were concerned about whether it would hold up in the snow. One commenter chimed in to say that he has had one up and running for a little under a decade. It's held up pretty well, though the zipper was close to deteriorating. Another car restoration specialist said that he used a cheap one outside his automobile repair shop but it blew away in a storm. Afterwards, he went to the local Home Depot and bought some heavy-duty wrecking bars and then pounded them into the ground outside his mechanic shop to serve as anchors- also using a rope spiderweb knot to secure it even further. Another commentator said that during strong wind storms gorgeous park his semi truck inside and tie the canvas garage down to the truck. However, another car owner who restores and flips show cars says that the potential of snow collapse is real- during one winter both of his show cars were flattened by heavy snow pack. One Caravan Canopy buyer told us that it was an affordable, easy to assemble option that was also suitable for organizing parties and catering. He observed that unlike most portable garages, setting up the Caravan Canopy Portable Carport does not require the use of screws so you won't have to go through the stress of finding the best cordless drill for screw driving tasks or any other assembly job. Subsequent to that, a hobby car restoration specialist who lives in upstate New York, where they get a lot of snow, advises that you shouldn't buy a cheap one. Instead, invest in an American-made portable garage and take care to hand sew any torn seams around the zipper for the framework. If you find the roof of your portable garage sagging under the weight of snow, one handy car owner used some two by fours and a snow rake- using the two by fours to push up from the roof from the bottom to have the snow slide off. Yet another buyer who purchased a Harbor Freight model was pleased because there are replacement covers. In addition to that, you can use some ratchet straps to knot the garage's frame to the automobile's bumpers. Parking a motor vehicle in a car port appears to be a relic of the past. Hail and plummeting tree branches are only a few types of ways an automobile can get harmed from simply living outside. This might be probably the most obvious, but rainfall, snowfall, wind along with other weather conditions are adversaries of a car’s external surfaces. They could leave dirt and acid on a car or truck that causes substantial damage to the exterior, like dreaded rust and a damaged top clear coat. Ultraviolet rays emanating from the sun can harm an automobile in manners most drivers don’t think about. Extreme hot and extreme cold can both result in degeneration of the outside and inside. Cars are a substantial purchase, and for most they’re probably the most precious things they own. Auto parking your new Corvette outside the house simply leaves a car subjected to wanton damage and thievery. A garage helps get rid of the enticement for people who want to harm or steal a vehicle. Whenever a car or truck is left in a garage those traveling in the vehicle don’t have to come in contact with any bad weather elements. It keeps everyone protected from hail, heat extremes, and other out-of-doors conditions when getting into or out of the motor vehicle. Some insurance providers provide reduced policies for individuals that store their car or truck in a garage. Who doesn’t want to save cash? Surprisingly, auto mechanics will easily notice if a car or truck is kept in a garage or outside. Auto exteriors are kept in improved condition when kept in a garage which can bring about increased resale prices. Additionally, having a warmer car comes faster air conditioning and heat. On cold days and nights, the heat will warm-up quicker than if the vehicle’s stored outside. Because a garage helps to keep a vehicle in a safe temperature range, the fluid and oil are held in a stable condition which results in an engine that operates much better than one that’s kept outside the house. Parking in a garage assists in keeping your auto’s windshields free from condensation and things like bird splat. It can be quite a nightmare for people when they face the prospect of having to do an expensive repair job on their vehicles. Things like getting a dent on the hood, a little smudge on the paint job or perhaps having a car accident can lead a person to instantly estimate how much his expenses will be in getting the damage fixed. Today the cost of car repairing has gone up considerably owing to the new technologies that mechanics use. This article will help you to understand how you can manage to lower your expenditure when you are repairing your car. A prime example of how new technology can add to your costs of repairs is the function of rear parking sensor. These sensors are embedded inside the bumper of your car. If you were to get unfortunately involved in an accident in which a vehicle hit your vehicle on the back, then your repairing costs will get extended from your bumper to your bumper and your remote sensor. Similarly, there are repair jobs which seem to be less costly like changing the wing mirror, but they can also get more expensive because the mirrors can be heated or they may have indicator lights. Sometime the dealer might charge extra for a repairing work. There are some advantages of having repairs done from workshops approved by the car manager, but this is cost-effective only when you are under the warranty period. You may even get the repairing done at entirely free of any cost. How To Manage Car Repair After The Warranty Period Is Over? When your vehicle is not anymore under the warranty of the car manufacturer, then you can find options which can help in bringing down your repair costs. You can find car breakers who sell parts of second-hand cars, which are in good conditions and can get used in newer cars which require repairs. It will lower the cost of the replacing equipment quite a lot. Bodyworks like bumpers, hoods, bonnet, wing and rear-view mirrors are some essential parts that can get salvaged and will also save you money. You can also find specific products getting sold in motor vehicle repair shops which can help to cover lousy paintwork and other such problems. You will only have to see a color that matches the color of your car and then apply the paint on the area where the problem is, and thus you can cover the imperfection easily. Also, you can lower the repairing cost extensively if you have an insurance policy for car repairing on your old or used car. You can visit Honda Repair Brooklyn to learn more about car repairing. There are a lot of different ways by which you can lower the costs of your car repairing. Check up on a few shops to see what the estimates are before you choose a shop to do the repairing work.